A while ago I bought some gouache (kind of a thick water color paint) to experiment with. One of the paintings I did was of Lian, a character in Tom Dell’Aringa’s comic Marooned. 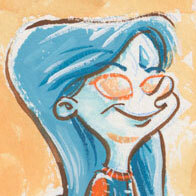 Here’s a glimpse of her, but go to the Marooned website to see the rest and read Tom’s great comics! And if you haven’t seen it yet (or even if you have), scroll down to the Ellie on Planet X Dance-O-Scope, before it moves off of the front page of the blog. We wouldn’t want you to miss out or anything.